A new type of student is bringing a new kind of energy to the UFV Mission campus this fall. 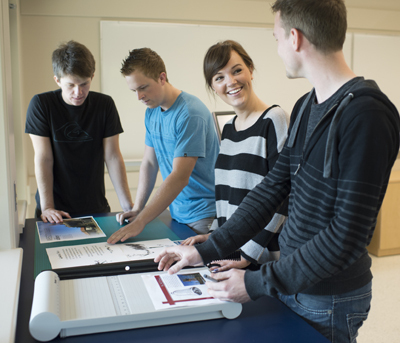 UFV has launched a Graphic and Digital Design program at its Mission site, located in the Heritage Park Centre. It’s technically a re-launch, as the program has been on hiatus for a decade, but with all the changes in the design industry in that time, it’s like a brand-new program. And thanks to a $500,000 contribution from the District of Mission, the program has four state-of-the-art dedicated classrooms and labs from which to run the program. 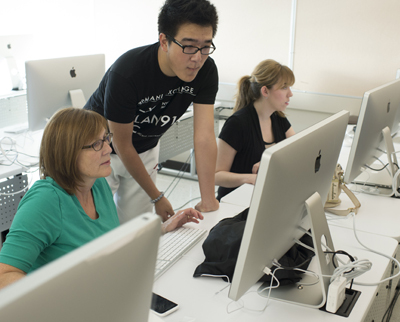 Students come in with their own Macbook Pro laptops complete with the Adobe Creative Suite, and UFV provides a working environment that models professional studios. Students have access to the entire Adobe font library, a production studio with colour printing, giant Thunderbolt displays to hook their laptops up to, a photo studio, a drawing and painting studio, computer servers, and lab support. “There is a huge learning curve with technology and software and the laptops enable unlimited access to tools. And they will serve the students well when they graduate and start their careers or continue their studies,” says Jager. Jager, who has considerable experience in the field of graphic design education through her previous work at Capilano University and her role as national vice president for education of the Society of Graphic Designers of Canada (GDC), is excited about being in on the ground floor of developing a new program and curriculum. She also brings current practical experience to the job, through her own graphic design consultancy. 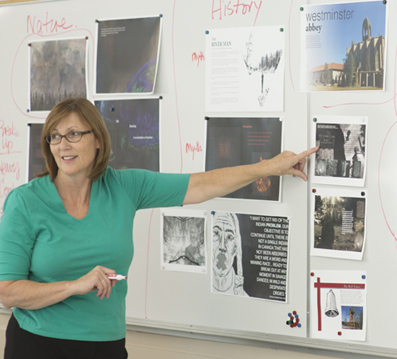 The two-year, 60-credit Graphic and Digital Design diploma provides students with a foundation of design skills, from which they will go on to learn about digital design for print and web. They study illustration, visual arts, interactive design, dynamic media (motion graphics and animation), and communication design. They will be prepared to work for a company or organization as a junior graphic designer, or set themselves for freelance work in the creative industry. Jager and her students are enjoying the warm welcome being extended by the Mission campus and community. A month into their studies, the students have completed two big projects in Jager’s courses: a digital wallpaper for screens where they explored elements and principles of design, and a second — a ‘zine’ about Fraser River Heritage Park where they learned about the design process. They are also taking visual arts and digital software courses from other instructors. See more photos of our new Graphic and Digital Design students and labs here. I was part of the Graphic Design program in Abbotsford and was really bummed that it had gone when I was ready to come back to it..
Ended up finishing my degree in the US (long story).. Glad to see this is part of the UFV corriculum, the school has a lot to offer! I’m so glad to see more colleges opening up this program.